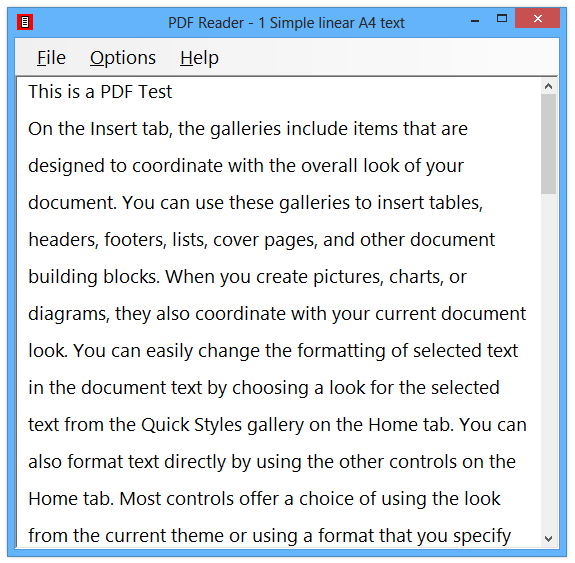 ﻿ PDF Reader - open Adobe PDF files as accessible plain text, OCR image files into text. This simple application opens PDF and image files as plain text. This makes it easy to read them with a screenreader. You can also save files as text documents so you can read them easily later. Inaccessible PDF files and image files (JPEG, TIFF) are OCR'd to extract text so it will give you the text for anything you can throw at it. PDF Reader is free. You can get it from the link below. You can run the MSI file from the link below. You will then have a desktop shortcut called "PDF Reader" you can use to start the program. You can also find "PDF Reader" in your Start menu. Installer for PDF Reader Install this Windows Installer MSI file to install PDF Reader. You may also need the .Net Framework 4 Client Version, which you can obtain from the Microsoft site. Easy to use, just open a PDF or image using the standard File dialog. You can also make the program the default PDF reader (handler). Opens PDF, JPEG, GIF, TIFF and PNG files with OCR where required. Opens inaccessible and accessible PDF files. It works with every screenreader, from Thunder and NVDA through to JAWS and WindowEyes. It even works with the built-in Windows Narrator! It uses big, clear 16pt text and line-and-a-half spacing so people with a little sight can use it without needing a screenreader at all. You don't need to be an administrator to install it, and it automatically updates itself, so you don't need to know much to keep it running - I'll take care of all of that from the WebbIE website. It's completely free. Go ahead and distribute and use it as you will. It uses the open-source pdftotext.exe program from foo labs, the Tesseract OCR program from Google and the GhostScript programs. PDF passwords are supported, but only for some older types of PDF security (e.g. PDF 1.3 40-bit encryption). You need to be on Windows 7 Service Pack 1 or later (Windows 8, Windows 8.1, Windows 10 are all fine.) 32- or 64-bit versions are all supported. The Microsoft .Net Framework 4 Client Version is required, but unless you have some weird set-up it should already be installed on your system. It's signed by Claro Software Ltd - thanks for their support. All the features in 4.0.0 should now actually work because the correct files get installed! Added support for opening image files by using Tesseract OCR: support for JPEG, GIF, BMP, TIFF and PNG. Added support for inaccessible PDF files: if no text content is obtained from opening a PDF file it will be OCR'd instead. Added support for non-Western (non-English) PDF files (e.g. Polish). Added TeamViewer option to Help menu for support. Added a colour change option so you can set foreground and background colours for maximum readability.